This inflatable medical tent is featured for detachable door in the middle of the tent, which make the tent to be dividied in small workroom for difference purpose. The door and groundsheet connected very well,so it can keep the whole tent as a seperated clear Workstation. Inflatable relief tent is supported by air columns which is made by high quality 0.6/0.9mm PVC Tarpaulin material welded to shape; as a Inflatable emergency tent,it is simple structured, high tensile strength, rigid, stable, wind resist, UV cut, water proof and so on. It can resist wind of 17m/s and can be well used from -35℃to +65℃;this Inflatable rescue tent is small volume, easy to carry around, no need to build but inflator air 5-8 minutes will be good to work; smaller unit can be combined together as a large inflatable red cross tent , in bad weather condition, you do not need to be out and can do all work inside; It is an air-sealed style Inflatable disaster tent, once inflator can keep working for one to two weeks with any out power, very convenient and suit for any difficult environment of emergency. 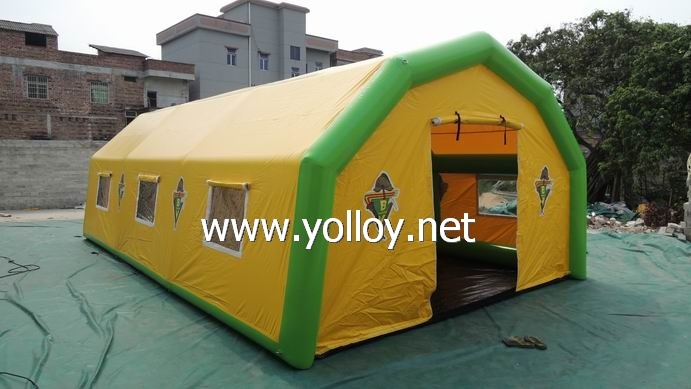 Inflatable Medical Tent are suitable for a variety of application such as field hospitals, troops lodgings, warehousing and maintenance hangars and have been successfully tested on field deployments.This air shelter tent are more and more used for relief, refuge, emergency and disaster is because that inflatable hospital tent can be set up very quick and move around. We can accept customized inflatable tent for different usage, please contact us for more information. please email to us or call our person for details.